I am a huge fan of the Real Techniques brushes, I have quite a few and am always looking to add to my collection. My fascination began with the powder brush which I was given for my birthday a few years ago, but then consequently lost on holiday and was truly gutted because it was one of my staple items. Anyway, for the purpose of this post, I have washed all of my brushed (except the Kabuki one oops) and put them back in their original packaging - note to self, I need somewhere or something to store my brushes in. Real Techniques Retractable Kabuki Brush - This is the best Kabuki brush that I have ever owned and I absolutely love the fact that it is retractable because it means it is easy to fit into your handbag, make-up bag, overnight bag or whatever and the bristles remain protected because the lid, which is very secure. protects them. The Real Techniques Core Collection - I bought this after realising I had lost my powder brush because there was a discount offer online which was too good to miss. The collection includes 4 brushes which are detailer brush, pointed foundation brush, buffing brush and contour brush and out of the 4, the buffing brush is the one I use the most. - Mini Foundation Brush: use with liquid foundation or concealer to touch up throughout the day. - Mini Shading Brush: transform your eye shadow on-the-go from day natural to night glam. - Mini Face Brush: effortlessly apply powder, blush and bronzer as needed during the day. As you might have noticed, I never did replace my beloved Powder Brush, it is always something I had planned on doing but never did and I actually don't know why that is. This mini foundation brush is actually really good, not as good as the properly sized version, but it does a good job and is especially useful for carrying around, taking on holiday and so on. From this kit, it is possibly the most used brush. I now have my eyes on Nic's picks because I love the look of the Duo Fibre Powder brush and the Cheek Brush. Do you have any Real Techniques Brushes? Do you have a favourite? These look great , I seriously need some new brushes. Love all of these brushes! !My favorite is the Base Shadow Brush!!! I think a set of good brushes is an investment if you wear makeup daily. 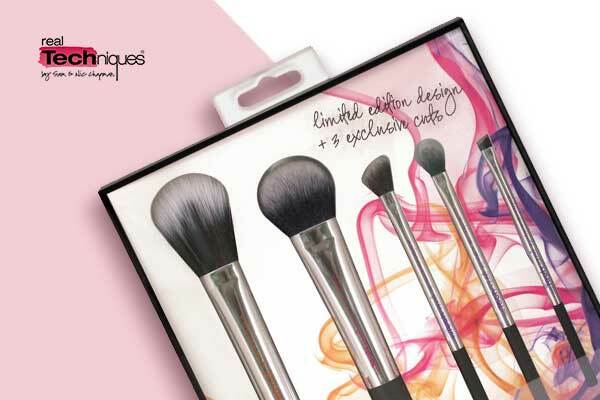 Ooh I need to get a retractable brush - I previously always wrap my brushes in tissues to pack them in an overnight bag! These look fantastic and make me realise how rubbish my brushes are! Apart from 2 lovely Clarins brushes all my are body shop ones that have seen better days and are older than my children. It really is time to invest in some new ones. These look good - I get by with only two brushes, probably need to re-evaluate my needs lol!! I've never heard of this brand and I need some new brushes.I use the bareMinerals' ones that come with their foundation and they never last long and start dropping bristles. What beautiful brushes, I may need to try these next - I need new brushes soon! I have a lot of Real Techniques brushes! I have the core collection, travel collection, duo fibre collection, powder brush, expert face brush and an eyeshadow brush! It's a bit of an obsession! Love the nic's picks set, they are all amazing! I got the 'core collection' ages ago and adore it! They look like really great brushes! Thank you for the great review! I have all of these apart from the new duo fibre ones! These look great - I love the different colours of them! !